Jacob Rees-Mogg has been branded “ill-informed” by the Irish deputy prime minister after suggesting people crossing the Northern Ireland border could be “inspected” after Brexit in the same way as “we had during the Troubles”. Tanaiste Simon Coveney said the Tory MP and senior Brexiteer, the chairman of the hardline European Research Group, was “ill-informed” after the comments surfaced in a video posted on Twitter. In the clip, Mr Rees-Mogg is shown at a town hall-style discussion on Brexit, talking about the border, which has proved one of the most difficult parts of the Brexit negotiations with Brussels to solve. Both sides have ruled out a hard border - which would contravene the Good Friday Agreement that ended decades of fighting in Northern Ireland. In the clip, Mr Rees-Mogg says that the UK could continue with “historic arrangements” to avoid a loophole that would allow people to get into the UK. He continues: “There would be our ability, as we had during the Troubles, to have people inspected. Mr Coveney highlighted the clip on Twitter, saying: “It’s hard to believe that a senior politician is so ill informed about Ireland + the politics of the #Brexit Irish border issue that he could make comments like these. 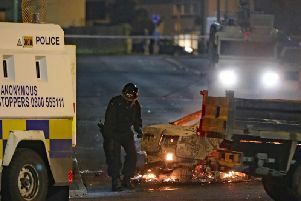 Fears of a return to violence have been raised if the Good Friday Agreement is damaged by the imposition of a hard border on the island of Ireland after Brexit. The EU’s suggested solution to the problem - a common regulatory area for goods and customs with the rest of the EU - has so far been rejected by the UK as “annexing” Northern Ireland. Theresa May has been adamant that such a move creating a border down the Irish Sea would be unacceptable to the Government. In return, Mrs May’s suggested solution, a complex customs arrangement that would see the UK collect duties for the EU, has been dismissed by Brussels. SDLP Brexit Spokesperson Claire Hanna MLA branded his comments “pig ignorant and a disturbing warning about the aspirations of extreme brexiteers”. Ms Hanna said: “It is offensive that a senior politician would use the ‘Troubles’ as benchmark for solving the border issue. This unguarded answer exposes how empty all the honeyed phrases about not returning to ‘the borders of the past’ over the last two years really are.